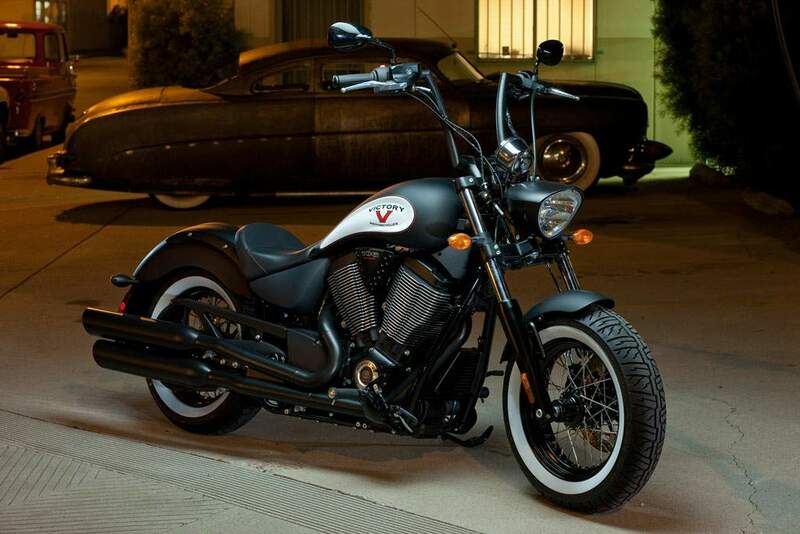 This Victory High-Ball’s minimalist, tough guy appearance results from its tip-to-tail matte finish black-out treatment, chopped fenders, ape hanger style handlebar, solo saddle and 16-inch spoke wheels carrying plump whitewall tires. It’s a look that unabashedly draws inspiration from the lowbrow bobber scene, where riders and bike fabricators in that two-wheeled subculture eschew brand loyalty, and instead fashion motorcycles into no-nonsense machines that seem to make some kind of anti-moto-establishment statement. 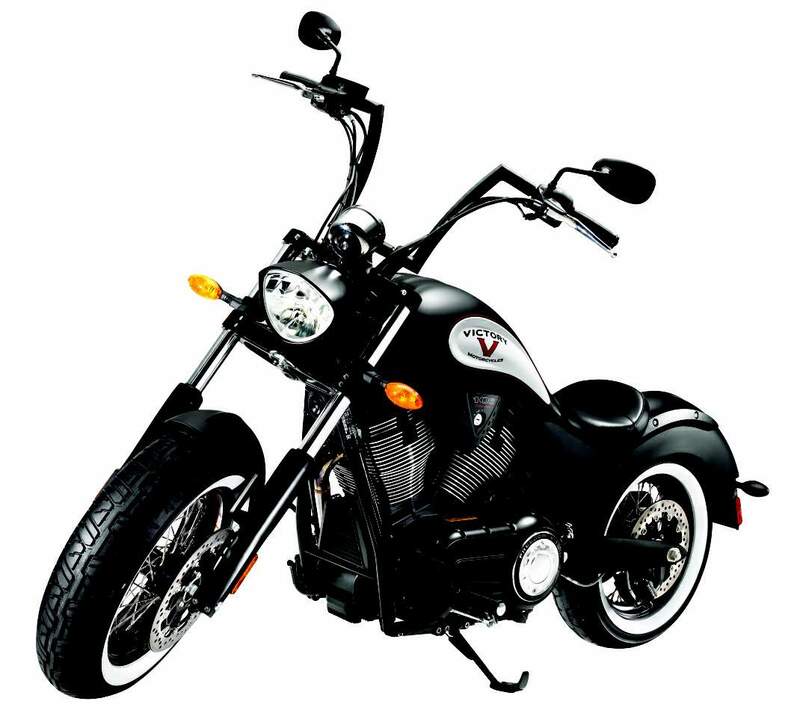 This latest cruiser from Victory sports a bobber motif and gives the Minnesota-based bike manufacturer a total of 16 models for 2011. While this latest offering from Victory is ultimately still mainstream, it does an impressive job of mirroring the “just gimme what works, man” sentiment that seems to issue forth from the bobber crowd. "It’s a look that unabashedly draws inspiration from the lowbrow bobber scene..."
Powered by Victory’s 106-cubic-inch, sohc, 50-degree V-Twin with 6-speed gearbox, this 106/6 is also graced with Stage 2 cams, and is likely the same engine design the Hammer, Hammer S and Vegas Jackpot models run with. Victory says this engine platform is good for 97 hp and 113 ft-lbs. The High-Ball looks as though it may have started life as Vegas 8-Ball. But aside from atypical Victory cruiser styling and the hot-rodded Freedom 106/6 powerplant, the High-Ball’s chassis dimensions also help define it as a new model. A shortest-of-all-Vic-models 64.8-inch wheelbase joined by a 31.7-degree steering rake make for a pretty aggressive combo of steering dimensions when compared to most other current Victorys, but the High-Ball’s longest-in-the-lineup 6.7 inches of trail helps tame those assertive numbers, and will likely serve up a somewhat quick steering but stable cruiser. The new Victory’s 25.0-inch seat height is second lowest in the line – only the Vision 8-Ball and Arlen Ness Vision have lower saddles at 24.5 inches. The High-Ball’s over-under slash-cut exhaust, and headlight and tank shape are standard Victory fare, but on this new bobber-themed Victory just about every visible component is given the black-out treatment, much like the price-conscious 8-Ball lineup. Victory’s most powerful standard engine, the Freedom 106/6 Stage 2, powers the new High-Ball. The High-Ball’s 43mm telescopic fork with 5.1 inches of travel, and rear suspension providing travel of 3.0 inches, is the same setup as on the Vegas, Vegas Jackpot, Vegas 8-Ball and Kingpin 8-Ball. Unique among Victorys is the High-Ball’s adjustable handlebar position that allows a rider to hang ‘em high in true ape hanger style, or rotate the bar into a lower, laidback setting. Victory says all that’s required to reposition the bar are simple hand tools, while control cables – and presumably switchgear wiring – are already setup to accommodate either position. Get on yer bad motorscooter and ride. Victory isn’t the first big brand to the ol’ skool motocool party. Harley-Davidson delivered the Cross Bones in early 2008, reaching into its own heritage for design inspiration, with touchstone features like a springer front-end, bobbed fenders, blacked-out motif, chubby tires and solo springer saddle that recall Harley’s post-war past. Yep, once again, H-D was there first. However, the 106 c.i. mill in the High-Ball is more powerful (although certainly not smoother) than the 96 c.i. counter-balanced Twin in the Cross Bones, and the High’s seat is a whopping 5.1 inches lower than the Bone’s springy saddle. Although the turnkey nature of the High-Ball’s style and attitude is likely the antithesis of the true bobber ethos, the bike nevertheless artfully mimics the genre. Most Performance: It's got the largest-displacement engine, the most horsepower and the most torque. Best Value: The High-Ball delivers the most performance at the lowest MSRP. - it's as much fun to look at the details as it is to twist the throttle. 16" lace wheels with 130 and 150mm Dunlop tires with whitewalls. Stainless steel spokes and Gloss Black wheels and hubs. 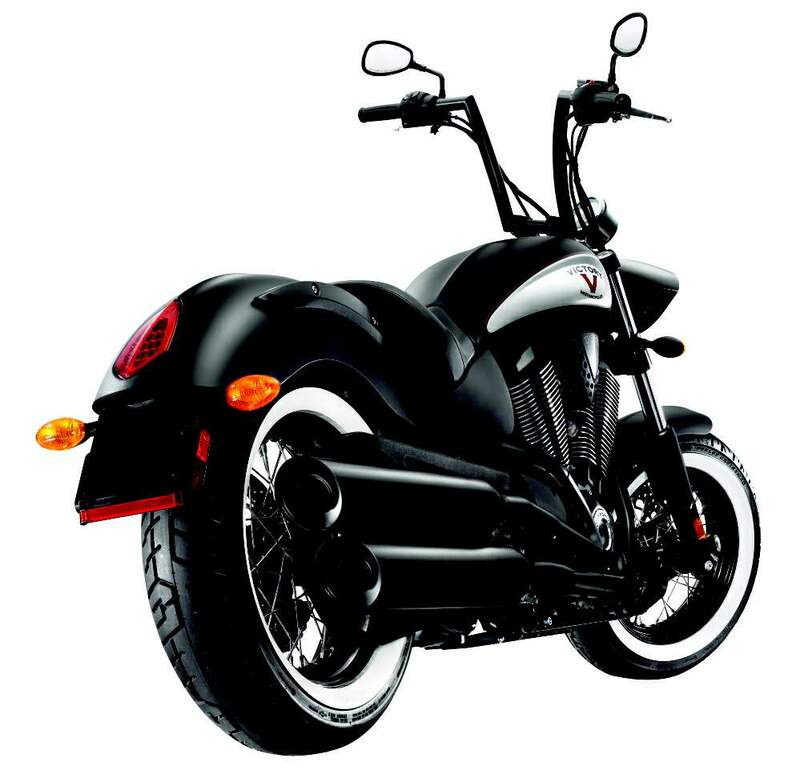 Freedom 106/6 V-Twin: Fuel-injected, counter-balanced, 97 hp & 113 ft-lb of torque. 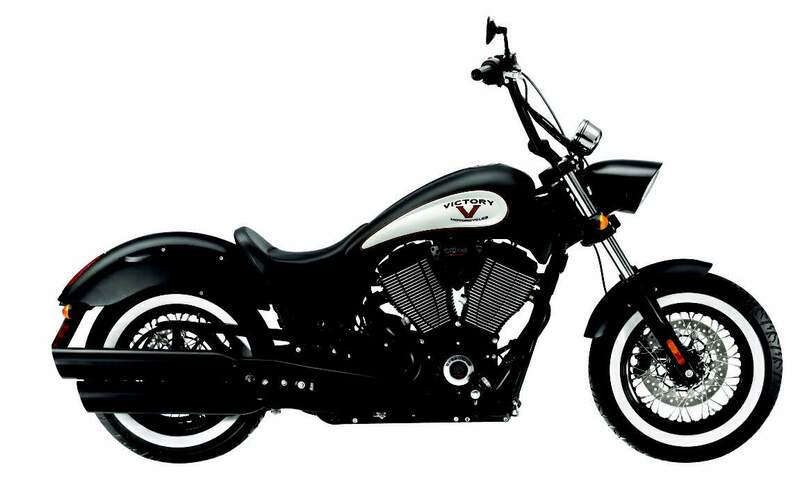 A 2-into-1 exhaust (black, naturally) will be available and most Pure Victory Gear accessories designed for the Victory Vegas, including passenger seats and passenger floorboards or pegs, also fit on the High-Ball. It's easy to personalize the bike to the way you want it, and build the perfect bike for you.